This radio was restored by the late Ernie Hite and it was sold at auction in March 2010 after his death. 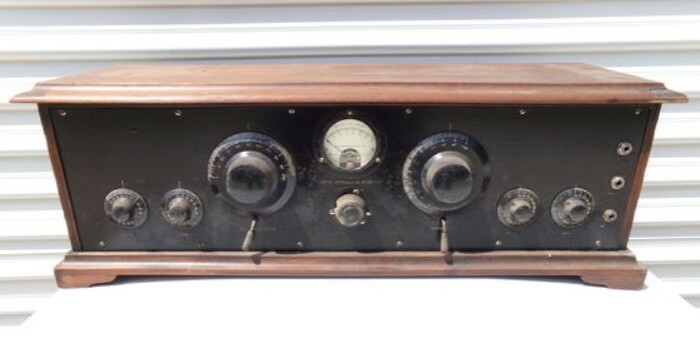 I got the pictures of this radio from Barry “otherzenithguy” via the Antique Radio Forum on December 7, 2014. This superhet is built with Radio Service Laboratories IF transformers. An inside view of the Ernie Hite set. It is very similar to the Wilson superhet. It uses the same IF transformers, the same triple range variable condenser to tune the input transformer, the oscillator coupler is very similar, and the set uses nine tubes with push-pull audio frequency amplification. I suspect the builders based their designs on the same set of plans. The IF transformers may have been supplied in a kit with the triple range variable condenser. Inside view of the Ernie Hite superhet IF transformer. Here is another example of a superhet that uses Radio Service Laboratories IF transformers (it is very similar to the Ernie Hite superhet).This radio was sold at a Estes Auction in July, 2016. Inside view of the Estes superhet. Again, nearly identical to the Ernie Hite set. The Wilson superhet is possibly related to these two examples that use Radio Service Labs IF transformers, but was probably manufactured a few years later.